Because cold drafts and huge temperature swings between the rooms in your home is not the norm. You are sitting in your home during the winter and feel an annoying, cold draft. Unfortunately, nobody forgot to shut the door - it is just another day in an uncomfortable home with insufficient or no wall insulation. Insulating the exterior wall cavities with RetroFoam injection foam will compress any old insulation in the walls and seal up the area to prevent air leakage - helping to reduce drafts, keep rooms more comfortable, control energy costs, and deaden outside noise. Foam insulation fills all the nooks and crannies in existing walls to provide the necessary air seal to reduce drafts and keep indoor temperatures consistent. Foam insulation in exterior walls can help to deaden the outside noise of loud vehicles, noisy neighbors, and barking dogs. Preventing air leakage improves your home’s energy efficiency, reduces the carbon footprint, and puts more money back in your pocket. The easy and convenient install process turns your family’s dream of a comfortable home into a reality - without the stress and mess of a full remodel. 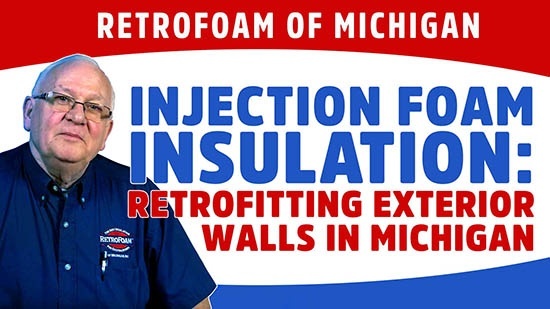 We’ve been insulating existing homes across Michigan with spray and injection foam for over 15 years. Our consultative estimators, highly skilled crews, and helpful office staff aim to guide you through the whole process with ease. Also, our lifetime warranty gives your family access to our family long after the job is complete. Our process for retrofit exterior wall insulation is quick, simple, and typically installed in just one day. Most walls are insulated from the outside, but we can also inject foam into walls from the inside if needed. However, the install process is slightly different depending on the home’s siding type. 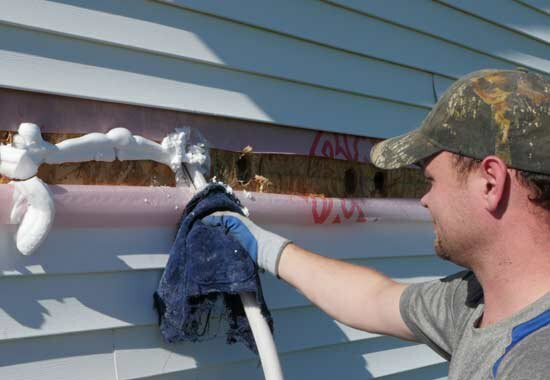 A strip of siding is removed from your home and holes are drilled between the stud cavities. After injecting the foam insulation in the cavity we plug the hole, put your siding back on, and clean up any excess foam. Depending on the condition and make of your wood siding, we may be able to remove it and follow the same process we do for vinyl and aluminum siding. If we aren’t able to remove it, we would drill through the siding to inject the foam, then plug the hole with a tapered wood plug. We can also insulate through a brick exterior without removing any brick. Our installers drill ⅝ inch holes through the mortar joints to inject the foam insulation, and the holes are re-mortared upon completion – matching the existing mortar the best we can. Concrete block walls can be insulated by using either spray foam or injection foam, depending on the look the homeowner wants to accomplish. The foam can be sprayed directly on the concrete wall, or in some cases, it can be injected into the cores of the concrete blocks. Not quite sure what injection foam is? Learn all about injection foam including its composition, areas it can be installed, and how it works in your walls. What is the Cost to Insulate Walls with Foam in an Existing Home? Curious about the cost to inject foam insulation in your existing exterior walls? Learn about the factors that impact the pricing, as well as what you might expect to pay for your project. Problems caused by poor wall insulation can cause drafts and uncomfortable rooms. 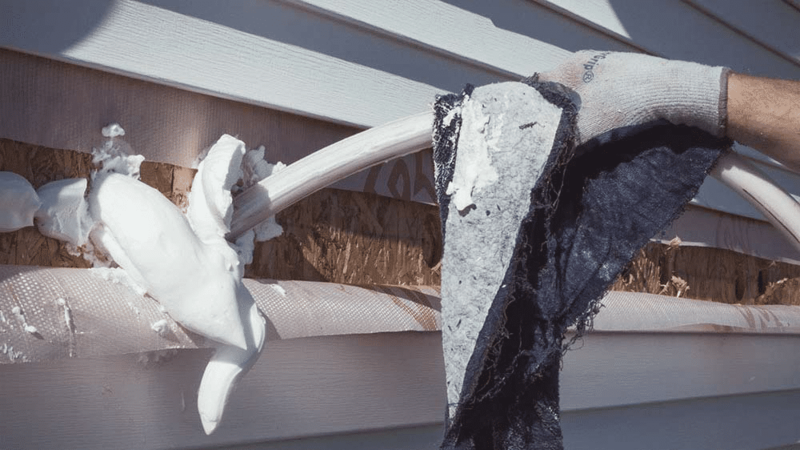 Learn what the common problems are and how to avoid them with the right wall insulation. What’s the difference between injection and spray foams? The difference is how they are installed. Injection foam is used to insulate exterior walls from the outside. Spray foam is used in any open cavity, including exposed walls, attic, crawl space, and rim joist. Learn more. Can the drywall pop off or crack in existing walls during installation? It’s rare, but it can happen. That’s why a lifetime warranty is important because those repairs will be made at no cost to the homeowner. Learn more. How do the crews know when a wall cavity is full? The installer runs the injection hose all the way to the top of the cavity and then all the way to the bottom. This helps to ensure the wall cavity is completely filled. Learn more. How does siding effect how exterior walls are insulated? Most homes have either aluminum, vinyl, or brick siding and in some cases wood. The process for installing injection foam for each of these is different. Learn more. Tell cold drafts and uncomfortable rooms who’s the boss.